It seems the Bada OS is pushed to the sidelines, what with Android and iOS combining for almost half of the devices sold last year. What's interesting is that Samsung themselves have accounted for a large portion of those Android sales. Does this mean that they are going to go full-fledged with Android in the future, putting Bada to rest at some point? Only time will tell. What it does mean is that for the time being Samsung are hedging their bets by keeping Bada in play. And they're making it fit for all budgets in a bid to secure wide backing for their homegrown OS. The impressive S8600 Wave 3 is of course their top-shelf offering, which we'd gladly recommend, if money is of no object. You get a screen which rivals most high-end smartphones, as well as a better processor, internal memory, and a 5MP camera capable of 720p video. The media playback functionality is also far superior. Granted, all of this comes at more than double the cost of the Wave Y. If a better camera and bigger screen are what you're looking for, but only just, then the Wave M offers a 3.6 inch screen (albeit at the same resolution), a 5MP camera, as well as a secondary front-facing camera for video conferencing, for about €60 more. That being said, it's hard to not consider an Android phone. The Android marketplace continues to grow, and the operating system provides many advantages simply not found on Bada's proprietary OS. 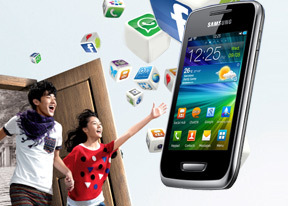 The Samsung S5360 Galaxy Y comes with Android 2.3.5 Gingerbread out of box, and features virtually identical specifications to the Wave Y, with the exception of a slightly inferior 240 x 320 resolution screen, and even worse video recording. However, it can be found for €120 in most markets, which is the same price as the Wave Y. As an added bonus, it keeps it even more compact. How about an HTC phone? The Android-powered HTC Explorer is more compact while sporting the same screen, and offers better stills and video. It's currently available for about €140 in most markets. The Sony Ericsson Xperia mini is the ultimate in compact smartphone design. The super mini beats the Wave Y on almost all levels and is ready to match the price too. If you're firmly against getting an Android phone, Nokia also offer some good alternatives. The Nokia C5-03 and Nokia 500 both offer superior 5MP cameras and higher resolution screens. The 500 is also upgradeable to the latest version of Nokia's Symbian-powered OS, Belle, and runs at about €150. The C5-03 is closer to the Wave Y price range. If you use a phone for little more than calling, the Wave Y more than adequately gets the job done. If you're looking for a budget phone without scraping the bottom of the barrel, it's priced competitively enough to factor into your decision. Some rival budget smartphones are a long shot away, but being comfortably close to Samsung feature phones may actually work in its favor.